If you’ve thought about veneers to improve the look of your smile, you probably know many of their benefits and the process for obtaining them. Where traditional veneers require reduction in natural tooth structure, no-prep veneers avoid altering existing teeth before the veneer is bonded in place. Even though most tooth preparation for traditional veneers requires little reduction in tooth enamel, some patients prefer the most conservative treatment method possible, something prep-less veneers can provide. Dr. Colquitt utilizes Glidewell technology to provide beautiful no-prep veneers at his Dallas, TX dental office. Can I Get No-Prep Veneers? No prep veneers are made to be especially thin in order to look as natural as possible ,as no natural tooth enamel is shaved down to accommodate treatment. However, no-prep veneers are still most beneficial for patients whose teeth are smaller and thinner and can benefit from additional thickness in order to look cosmetically pleasing. Dr. Colquitt finds that patients most enjoy the results of their treatment when they know what to expect and can choose the procedure that best fits their needs. It’s important to note that no-prep veneers typically won’t work in cases where a tooth is improperly positioned, as the best way to change alignment by adding a veneer is to prepare teeth beforehand. Patients with large or forward-positioned teeth are also not ideal candidates, as no-prep veneers may make these teeth look too-bulky. 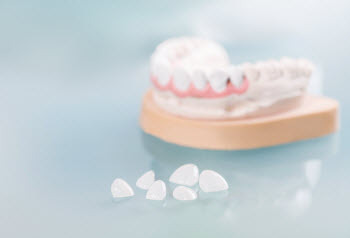 As prep-less veneers are as thin as possible, they may not completely conceal deep staining. Talk to our office about other cosmetic treatment options for deeply discolored teeth. Consulting with Dr. Jeff Colquitt to prepare your treatment plan is a mandatory step in achieving your goals. Our Dallas cosmetic dentist and team make sure to go over all facets of your treatment plan so you can feel confident in choosing veneer therapy. Ask Dr. Colquitt about No-Prep Veneers – Contact Us Today! If you have questions or would like to make an appointment, contact our office today and learn more about how we can help you achieve the smile you’ve always wanted.